"On a recent Thursday, Grand Wizzard Theodore was busy DJing in his home borough of the Bronx. Theodore is widely acknowledged as the man who invented turntable scratching, so his presence behind the decks was not unusual. The venue, however, was unexpected: The Cornerstone Academy for Social Action – a middle school, where Theodore's selections were soundtracking furious Lego-building. 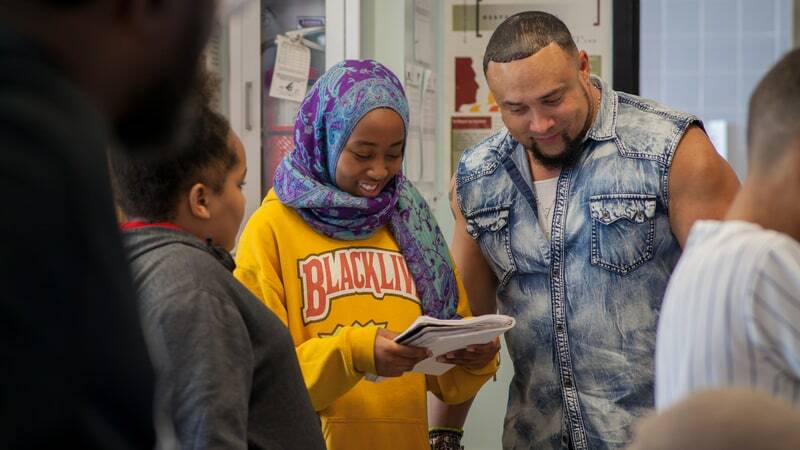 While Theodore cued up hits, Mike Ford, founder and leader of Hip-Hop Architecture Camp, was guiding a group of sixth, seventh and eighth graders as they assembled Lego models based on rap lyrics. Students gathered around the table where one of their peers was working with lines from Grandmaster Flash & the Furious Five's "The Message:" "Broken glass everywhere/ People pissin' on the stairs, you know they just don't care/ I can't take the smell, can't take the noise/ Got no money to move out, I guess I got no choice." This student created a literal representation of the song's image: a staircase, a sprinkle of green pieces for "broken glass everywhere" and scattered yellow pieces for "people pissin' on the stairs." "Good start," said Ford. But he gently pushed the student towards a more constructive response to "The Message." "Could there be a building made from all the broken glass?" Ford wondered. "Let's start to think about how we can make it so that nobody has to say those words in their song again." Ford sees his teaching as a way to counter the troubled history of urban planning in America. "We've decimated cities that were built by the hands of African Americans – like Black Bottom in Detroit, or here in the Bronx, when they built the Cross Bronx Expressway through a community of color," he says. "Those decisions are made by people outside of those communities. There are a limited amount of people at the table to advocate for our communities."